I bought a big bag of chillies out of poor memory. I thought I needed 400g of chillies for a recipe but ended it needed only 4 pcs. I am now getting phobia of throwing food out. So in order not to have food wastage, I churn some achar and sambal. Well, last week, I had a craving for achar so we went to my favourite Roast Pork/Char Siew stall for our dinner fix. This stall has a special touch, instead of the usual cold cucumber slices, it is replaced with achar and I love their achar. With my craving, hubby ordered extra serving of achar and guess how much was it? S$1 for a tiny packet, I was shocked! I think it was only one tablespoon full! Even though I like theirs, I was so adamant to make my own achar after that. Why did I take such a long time to decide to make my own? Well, I had a big time failure the last time I tried. Very ambitious, I bought tons of vegetables but ended up throwing the whole lot away. The recipe was totally unreliable! Guess it become a phobia. So this time, I chose one from Sugar and Everything Nice. I was less ambitious this round, even fact, I was so timid that I actually minus out lots of other ingredients listed. Sorry J, no hard feelings. Guess what, now I regretted not making the full whole recipe! It was just so yummy! Thanks J for sharing this wonderful recipe! Though lots of work but it is worth it! As for the sambal, I have asked friends for a good reliable recipe but all told me that they go by estimation and gut feel, thus no recipe for me. Am going to share some with PS when we go to her house to check out the gym attire, let’s hope she likes it. In a hot wok, add 6 tbsp of oil. Add in grinded ingredients and slowly fry till it turned to a nice deep tone. Seasoned with lime zest, salt and sugar. Continue to cook for about 10 mins. Add a dash of lime juice before serve. Place cucumber and carrot strips in a bowl. Mix weall with 1 Tbsp salt and leave for 30 minutes. Then wash thoroughly with water and drain. Using a piece of muslin cloth, squeeze out as much water as possible from the vegetable strips. Half fill a large pot with water, add half of the vinegar and bring to a boil. Add a pinch of salt to the water. Then blanch the vegetables in batches for about 4 minutes. Remove and transfer to a colander, drain well. Heat a large wok or large frying pan. Add the oil and once hot, fry ground ingredients (A) for 2 minutes. Then add in ground ingredients (B) and fry until fragrant and the oil separates - about 10 minutes. Add remaining vinegar, sugar and 1 tsp of salt. Stir in the peanuts and mix thoroughly. Last add in the vegetables and stir well. Keep acar overnight in the refrigerator for the flavours to develop. To serve, dish out and add a sprinkle of toasted sesame seeds. * Acar can be kept in the refrigerator for about 2 weeks. I can't taste the pixels but they sure look very good. 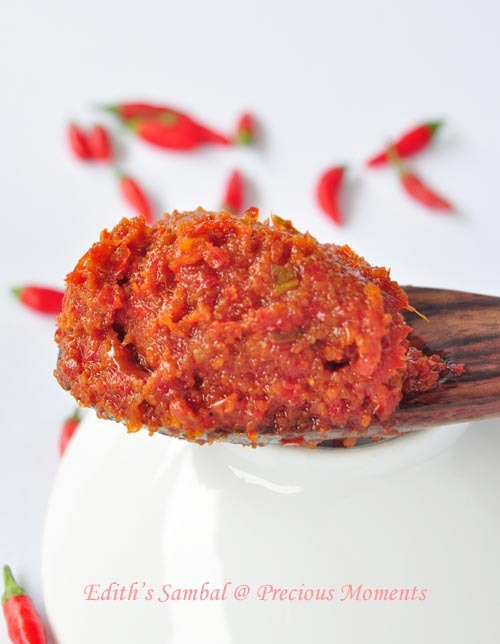 What an easy & interesting way making your sambal achar. Thanks sharing the recipe, Edith. Kristy, this is my second attempt. My first attempt failed miserably. This one is cook method. My mom said she has one that don't use cooking method. Will try hers once I get my achar crave again. Gosh! I love achar! Drools! hahah Alice, I hope so coz hubby not home to be my tester. I love acar too! When my mum makes it I can eat kne whole bowl by itself. I do think that store bought acar is expensive and not as fresh. Angel, the roast pork stall ones is fresh coz their biz is very very good. But for S$1 for a thiny bit, I am def not willing to pay. 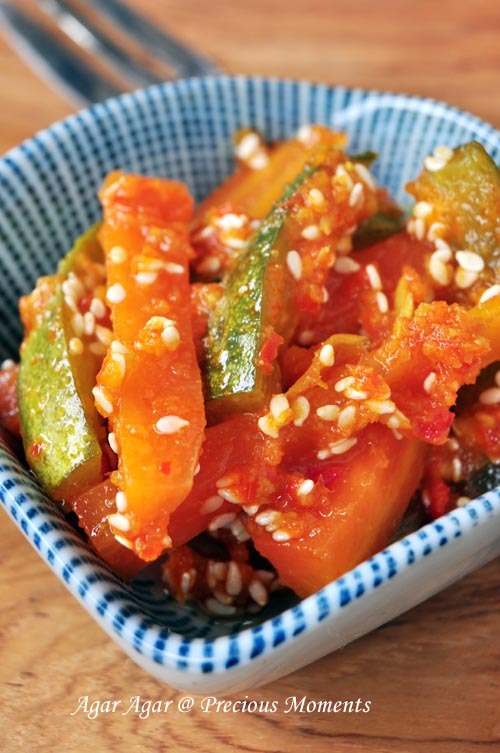 Edith, I love achar, this really looks very good! Looks really spicy but so appetizing too. Wow, love the colour of the sambal! Wonderful recipe. Thks for dropping by my blog! I'm following u at GFC & would love to have u follow me too! Edith, Come & join my Vitacost US$50 International Giveaways! Good luck & see u there!